There are many advantages to running an Isuzu truck. We have always cared about our customers and the success of their businesses, and understand that a company’s success or failure can depend upon the efficiency of its vehicles. This is why we have developed our award-winning customer care programme, a unique and comprehensive customer service programme designed around the challenges our customers face. All of the trucks in our range are designed and engineered for maximum payload capacity, increasing the weight you can carry on each journey and reducing the total number of journeys you have to take. Innovative engineering makes our vehicles robust and reliable. They are designed to cope in some of the world’s most challenging environments and terrains, making them a good choice if you require a vehicle that can withstand prolonged use and punishment. We are confident our trucks can stand up to whatever you need them for, so we offer 3 years’ unlimited mileage warranty as standard across our entire range, from 3.5 tonnes all the way up to 12 tonnes GVW. The compact cab design of our vehicles makes them ideal for multi-drop delivery companies, as the cabs are lower to the ground and provide easier access for drivers and passengers. The shorter cab length also means our trucks have a tighter turning circle, which makes it much easier to manoeuvre them in and around housing estates and narrow country lanes that would otherwise be difficult to access. 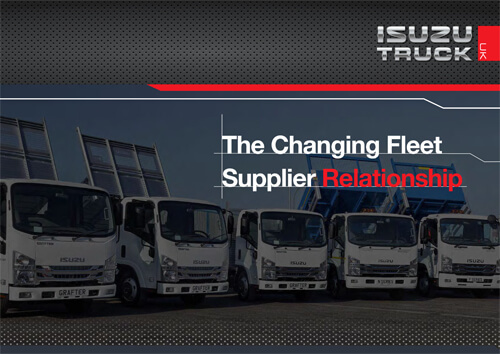 An Isuzu truck is a sound investment for your business. Not only are our vehicles competitively priced and available with a range of flexible finance options, you can bring your whole vehicle life cost down by agreeing a fixed-price repair and maintenance contract with our R&M team. This allows you to plan and budget ahead by securing all necessary repairs, services, inspections and maintenance at a fixed price agreed directly with Isuzu Truck UK. When you buy an Isuzu truck you are automatically included in our award-winning customer CARE programme. As part of the programme you will be assigned a Customer Care Liaison Executive who will contact you at regular intervals to ensure you are happy with your truck(s) and the service you are receiving from us. No other UK truck manufacturer offers such a comprehensive customer service programme. Pete Murphy, Managing Director, Isuzu Truck (UK) Ltd.
All trucks in the Isuzu range offer many features that normally appear as ‘optional extras’ on other manufacturers’ vehicles as standard. These include; reinforced floor structure, door intrusion bars, noise suppression, driver and passenger SRS airbags, keyless remote-control door entry, central locking, RDS radio and CD player, electric windows and pre-tensioning seat belts. We’re not ones for blowing our own trumpet, but we are passionate about what we do and the services we offer. All of our customers, both new and old, can rely on us to provide the best possible service to them and their Isuzu truck.